GamePlanX provides you with solutions to grow revenues. We don't just give you a set of PowerPoint slides or a report that is complex and expensive to implement. GamePlanX provides a comprehensive solution that include proven processes, analytics and technology so you can formulate winning strategies, manage and train teams to execute, and get compliance reports to track and measure your performance. We apply an innovative approach by combining high-end strategic consulting that is infused with our powerful GPX project and team collaboration technology platform to ensure that your team executes as planned to meet business goals, grow revenues and reduce cost. Scale operations globally with our powerful project and team collaboration technology platform. GamePlanX recognizes the importance of conducting thorough best practices based research, detailed analysis and assessment to formulate a well-thought-out strategy and project plan. We enable you to apply proven processes, Big Data analytics and research to collate the massive amount of information associated with any of the goals your business is striving to achieve. Information that includes business landscape analysis: primary and secondary market and target audience research; qualitative and quantitative operations research leading to clearly defined goal setting are assessed. GPX also offers a panel of expert, who work through the GPX project engagement framework to understand project requirements, research proven best practices to formulate a winning strategy and plan that can be successfully executed. A well-defined plan infused with powerful technology enables your team to execute with confidence. Our solutions enable your team to stay focused to maximize efforts, leverage resources, reduce organizational redundancy and ensure accountability. The plan you get to execute charts the direction of your campaign, ensuring a successful outcome, while shaping the future of your organization. 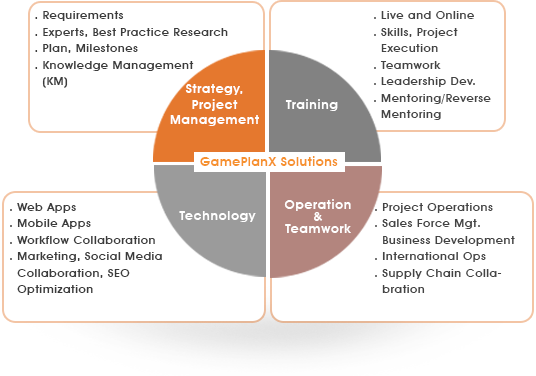 GamePlanX offers all the modules required for efficient project management, team training, collaboration and execution. Apply a proven process, get a plan that assigns tasks, establishes deadlines and targets, train teams to execute as planned and monitor progress. You get to generate demand and hot leads, grow revenues, manage business development, increase sales channels, train and manage teams to execute. We make it easy to get multi-location teams to execute campaigns, monitor progress and make corrections for sustained program delivery. GamePlanX provides training so your team can get familiar with the tools required to execute the processes and plan accurately. Once the processes and project plan are setup on your GPX intranet, your team is trained to use the project, document, knowledge and conference management modules. The modules are very effective for training multi-location, multi-organization, multi-cultural teams to collaborate on projects to execute processes. The GPX platform can also be configured to develop and implement multimedia instructional new hire onboarding, contract compliance or professional development training programs specific to your organization. GamePlanX helps client teams achieve high-performance teamwork. The GPX project and team collaboration platform is based upon principles derived from Professional Sports, Military and Emergency Healthcare teamwork to facilitate high-performance execution. We equip all members of your organization with access to the right Process, Knowledge Management, Training, Conference and Collaboration Tools so tasks can be executed accurately and as planned. We also incorporate the concept of community based support and collaboration (1:1, 1:M, M:M) to enable efficient learning, communication and job execution. By infusing research, analytics, strategy formulation and planning with technology, we empower teams to successfully execute proven operational strategies that solve challenging problems. The GPX modules are designed to enable multi-location, multi-organization, multi-cultural teams to collaborate on projects to execute processes.
.	Search Engine Optimization (SEO). For public and private sector projects, stake holders often want to know the measurable impact and outcome the programs they are funding are having on predefined goals. The GPX platform allows for systematic collection, publishing, and distribution of information to answer questions about the effectiveness and efficiency of projects. We enable real-time communication and efficient flow of project outcome and financial reporting amongst all project stake holders. We can also incorporate knowledge and risk management requirements with proven operational and financial reporting procedures to work for a program/contract management system. You can obtain the following reports from program monitoring, audit reporting, performance evaluation and corrections for sustained program delivery. Enabled our clients to recruit medical experts to prepare and deliver live and online training to 1000s of physicians in over 72 countries. GamePlanX offered its technology platform to support all aspects of conference planning in multiple cities, ranging from program/event planning, speaker scheduling, and travel coordination to content preparation, attendee pre/post conference outreach, networking and learning. Facilitated providing healthcare to more 23,000 people, including HIV/AIDS prevention and care, access to physicians, prenatal care, clean water and supplemental nutrition and hygiene training. GamePlanX developed successful educational plans for transforming education in the Middle East and a non-profit global community development organization educating children from K-12 in developing countries. As result of the plan, more than 13,000 children received high quality education. GamePlanX developed health smartphone apps and websites enabling consumers to track their health status related to nutritional value of food items and weight maintenance by which creating and sustaining a healthy lifestyle. GamePlanX manages a team of experts and an off-shore technology team to develop, launch and market state-of-the-art apps and websites by integrating numerous complex technologies, including trending charts, tools and other digital engagement elements. Because of our streamlined operation, the client's estimated project cost decreased by 45 %. GamePlanX enables clients to compete against multi-billion dollar companies and position themselves to grow their revenue from $1-2MM to more than $30MM. 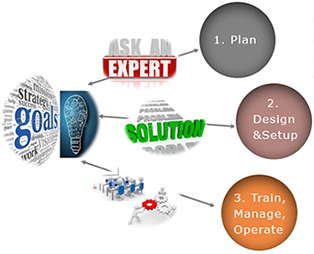 GamePlanX provides expertise in Business Development, Proposal Development and Capture Management. The GamePlanX technology platform is configured to provide CRM, Supply Chain, Proposal/Capture Management, and the GamePlanX virtual office facilitates telecommuting and timely team collaboration. GamePlanX worked with a global travel agency to reduce operational costs and improve team efficiency by about 65% in multiple cities worldwide. GamePlanX offered solutions for conference management, travel and destination CRM, and multi-city GPX virtual office for telecommuting.